We are a leading manufacturer & supplier of table lamps, wall lamps, floor lamps & ceiling lamps in metal like brass, aluminum & iron even in different woods like mango, shisham etc. The same design is in brass & iron combination with crystal decorated in each iron circle. Packaging Details Single Pieces packed with polystylne in a seprate master carton. 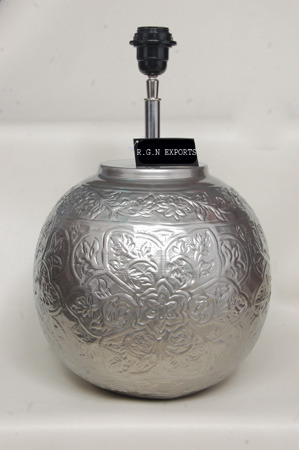 A perfect melange of excellent craftsmanship and state-of-the-art manufacturing unit, "R. G. N. Export" established in 1994, our handicraft products are known for creating an ambiance of splendor and royalty. Incorporating latest technology, we ensure that our decorative items such as Brass Cremation Urns, Wooden Cremation Urns & Caskets, Stainless Steel Cremation Urns, Metal Furniture, Candelabras,Garden Decorative Items Oil Lamps, Singing Bowl, Steel Lantern etc. are neatly finished and meet the quality standards. Quality tested raw material is procured from reliable vendors to impart durability and reliability to our ecstatic and dazzling range of decorative items. We are committed to serve our customers with the customized products that are a rendezvous of exquisite and mesmerizing designs. We Are Looking For Export Queries.